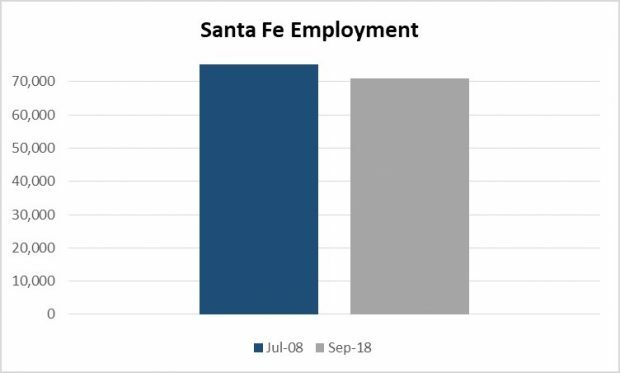 But the bulk of the state’s employment comeback occurred in Albuquerque. (Las Cruces made an additional, although paltry, contribution.) The Duke City is, happily, up more than 20,000 jobs since just before the downturn hit. Sadly, two of the four metropolitan statistical areas in the Land of Enchantment remain in employment droughts. 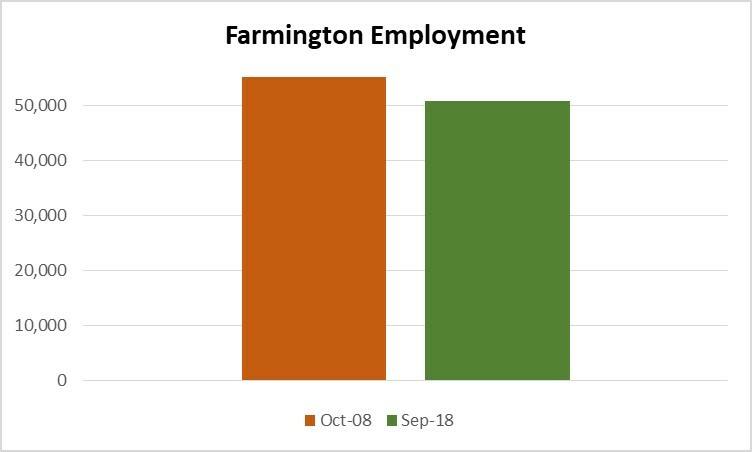 As the charts below indicate, Farmington is down 9.3 percent from its October 2008 peak, while Santa Fe is 8.6 percent beneath is apex of July 2008. Farmington’s suffering from a trend in low domestic prices for natural gas, but what is Santa Fe’s excuse? Errors of Enchantment suspects that taxes, a “living wage” of $11.40 per hour (both city and county), social engineering, and rampant NIMBYism might be factors…. We’ll see an employment surge in Santa Fe as the new governor restores state government to its customary overstaffing. Unfortunately, the feds (I don’t trust state data) don’t have anything more current, but I suspect the numbers aren’t much different for ’16, ’17, and ’18, given the budget climate until very recently. The high point was in 2007, with 52,255 FTEs. I’m sure the goal of the government-employee unions (and their enablers in elective office) is to get back up to that number, and even exceed it, as quickly as possible….